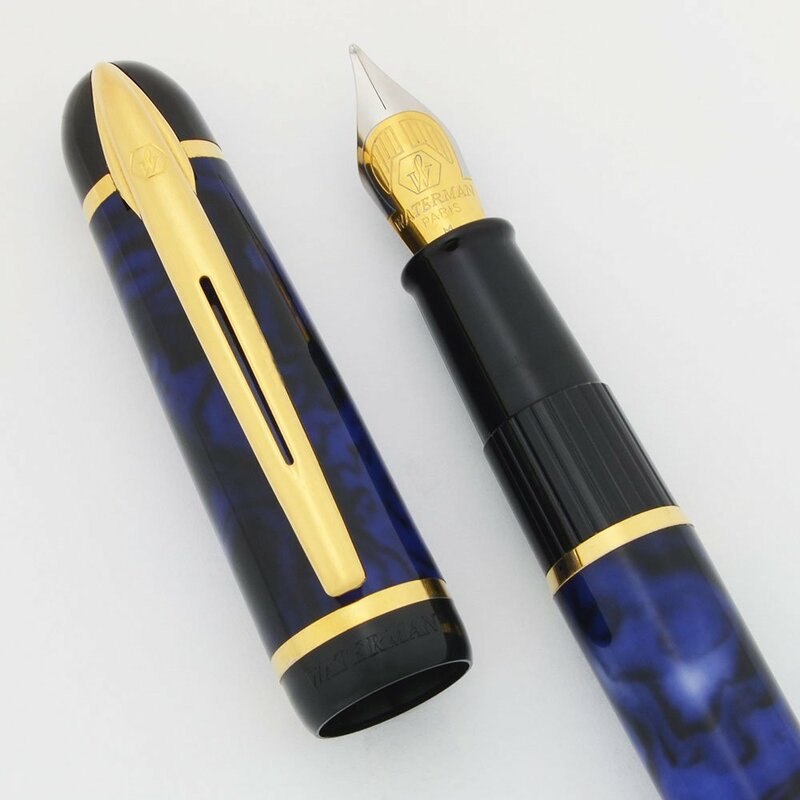 Waterman Phileas fountain pen from the late 1990s or earlier 2000s. Blue marble body and cap with gold trim. Medium two tone nib. Superior condition, pre-owned and working well. Manufacturer and Year Waterman, France – from the late 1990s or earlier 2000s. Color Blue Marble. It's a rich blue with black and greyish marbling and gold colored trim. Nib MEDIUM two tone Waterman Paris steel nib marked M. It's smooth with just a touch of springyness. The nib has no pitting, which is rather unusual for this era of Waterman steel nibs. Condition Superior condition. The pen has handwear that dulls the general appearance of the pen but it has no real wear. The band at the end of the barrel has a gap opposite the more ornate part of the band but that is original and not a crack ( we see this frequently). No cracks, chips, or major scratches. A few marks on the trim are present. The pen is working well.